In a deal with the US, Uruguay has agreed to accept five prisoners from Guantanamo Bay as refugees. It comes as the Obama administration struggles to close the notorious detention facility. 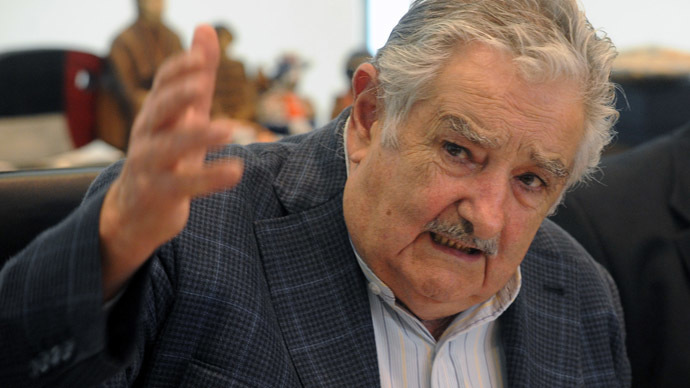 "If the inmates of Guantanamo want to make their nests in Uruguay, they can do it," President Jose Mujica told Channel 10's 'Subrayado' program while at a farm fair in rural Uruguay on Thursday. However, he stressed that he "would not be their jailer," adding that the future former inmates will be given refugee status in the South American country. "It's a request for human rights reasons," the 78-year-old president said. "They are coming as refugees and there will be a place for them in Uruguay if they want to bring their families." According to two reports on the issue – the first published in the local weekly Busqueda magazine and the other by AFP citing a source – Uruguay accepted the US proposal to take five detainees from the Cuba detention camp for two years. Mujica reportedly agreed to the proposal after speaking to Cuban President Raul Castro and sending delegates to visit the detention center, the Busqueda report said. It added that US Secretary of State John Kerry thanked Mujica on Monday and confirmed that President Barack Obama would receive him at the White House before the end of June. Meanwhile, US officials confirmed that negotiations concerning Guantanamo detainees have been ongoing. However, they did not confirm that an agreement had been reached. "The US government maintains high level conversations with the Uruguayan government on various global affairs," the US embassy in Montevideo said in a statement. "One of those has been the closure of Guantanamo, one of the Obama administration's priorities for its humanitarian implications." Some 154 inmates remain at the prison, which has been widely criticized by human rights groups for many issues – including denial of fair trial and using torture methods on detainees. Last Thursday, the US military announced that it had repatriated an Algerian detainee, 44-year-old Ahmed Belbacha, back to Algeria. Convicted on charges related to terrorism, he was held at Gitmo for more than a decade. Guantanamo Bay was established at a US naval base in Cuba in 2002 by former President George W. Bush following the September 11, 2001 terror attacks. It was established to hold terror suspects rounded up all over the world. However, most of the inmates have never been charged or tried.